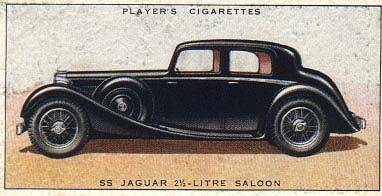 All the qualities that made SS cars famous are enhanced in the Jaguar. A new and more efficient o.h.v. engine in a strong but light frame gives astonishing flexibility (6 to 90 m.p.h. on top)and acceleration from zero to 60 m.p.h. in 16 seconds. The attractive body is luxuriously furnished, providing real comfort and ample room for passengers and luggage. The six cylinder engine is of 73 mm bore, 106 mm. stroke and 2,663.7 c.c. capacity; the R.A.C. rating is 19.84 h.p. and the annual tax 15 Pounds. There is a four-speed synchromesh gear-box. The chassis has a 9 ft. 11 in. wheelbase and a 4 ft. 6 in. track. The car is priced at 385 Pounds.